A Working Holiday in Japan is designed to foster young people with global perspective and enhance friendly relationships between Japan and partner countries/regions. A Japan Working Holiday Visa allows you the flexibility to work and travel around Japan, for a period of up to 1 year (18 months for Australians). Since the Working Holiday programme is intended to promote greater mutual understanding, the applicant’s primary aim should be to holiday in Japan. The programme is not designed for persons who mainly intend to work or study in Japan (for which purposes the appropriate visa should be sought). To fully appreciate the many different aspects of Japan, it is advised that the working holiday applicant moves to different areas within Japan at approximately 3-month intervals. OUR FREE WORKING HOLIDAY GUIDE! 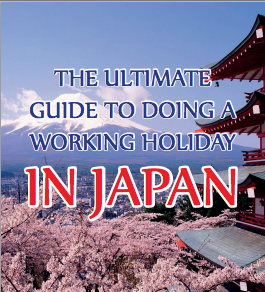 Learn all you need to know to have an amazing Working Holiday in Japan. Are you Eligible? How do you Apply? What should you do while you’re there? Find these answers and much more in our Ultimate Guide! For official information (location of your nearest Japanese consulate to apply at etc), and to download the application forms, visit the Government’s website Here. WANT TO DO A WORKING HOLIDAY IN JAPAN RESORTS? Working in a Ski or Beach Resort is the perfect way to start your working holiday in Japan. We can help you find a job, prepare for your trip, and support you for your entire time in Japan. Learn more or Apply now!